Image credit & copyright: Roscosmos/ESA. Launch Alert! 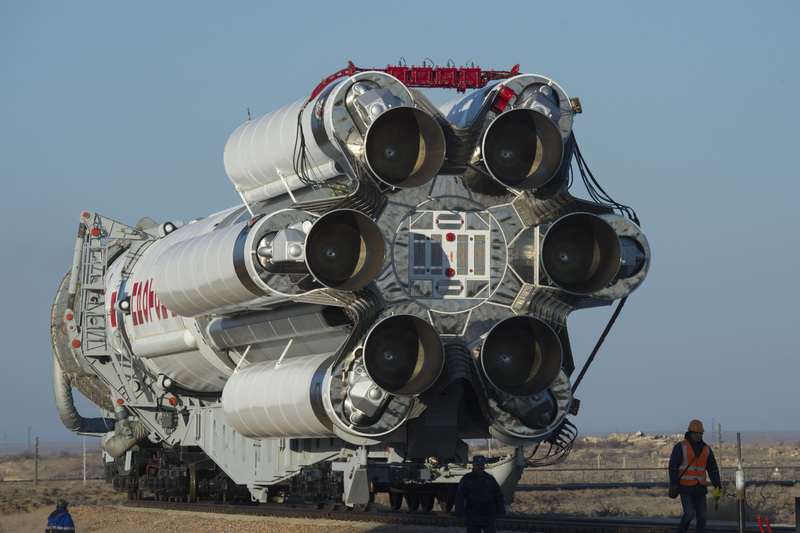 Monday, September 11, 2017 at 19:23 UTC (15:23 EDT) an International Launch Services (ILS) Proton-M rocket will be launching from Launch Pad 39, Launch Complex 200 at the legendary Baikonur Cosmodrome, Kazakhstan to deliver the Amazonas 5 communication satellite into orbit for HISPASAT of Madrid, Spain. THE ROCKET: The Khrunichev State Research and Production Space Center, Proton-M rocket is a three-stage, heavy lift rocket that stands on average, 58.2 m (191 ft.) tall, 7.4 m (24 ft.) in diameter and boasts some serious history. 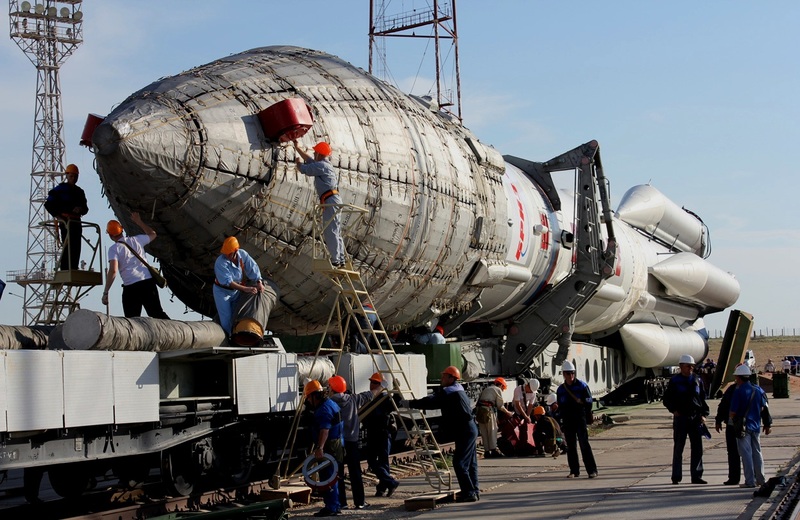 With its first launch back on July 16, 1965 the Proton rocket family has been a workhorse for the Russian space program launching legendary names such as the Salyut series, Mir, and the Russian segments of the International Space Station. Launches fly out of Sites 81/24 and 200/39 at the Baikonur Cosmodrome, Kazakhstan. Payload Fairing (PLF): The Proton PLF flies with either a 13,305 mm (43 ft. 7 in.) “short” or 15,255 mm (50 ft.) “long” two-shell protective enclosure that protects the payload during launch and throughout ascent before being jettisoned in the upper atmosphere. 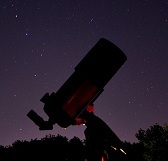 Breeze-M (Briz-M) Upper Stage: is 2.6 m (8 ft. 7 in.) in length and 4.1 m (13 ft. 1 in.) in diameter and is powered by one S5.98M engine utilizing unsymmetrical dimethylhydrazine (UDMH) for fuel and dinitrogen tetroxide N2O4 as an oxidizer. The Briz-M boasts a specific impulse of 326 sec, delivering 19.62 kN (4,410 lb.) thrust with a burn time of 3,000 seconds. The 8S812 Third Stage: Proton’s third stage is 4.11 m (13.5 ft.) in length and 4.1 m (13 ft.) in diameter and is powered by one RD-0212 engine utilizing unsymmetrical dimethylhydrazine (UDMH) for fuel and dinitrogen tetroxide N2O4 as an oxidizer. The third stage boasts a specific impulse of 323 sec, delivering 613.8 kN (102,652 lb.) thrust with a burn time of 238 seconds. The 8S811K Second Stage: Proton’s second stage is 17 m (56 ft.) tall and 4.1 m (13 ft.) in diameter and is powered by three RD-0210 engines and one RD-0211 engines utilizing unsymmetrical dimethylhydrazine (UDMH) for fuel and dinitrogen tetroxide N2O4 as an oxidizer. The second stage boasts a specific impulse of 327 sec, delivering 2,399 kN (539,000 lb.) thrust with a burn time of 206 seconds. 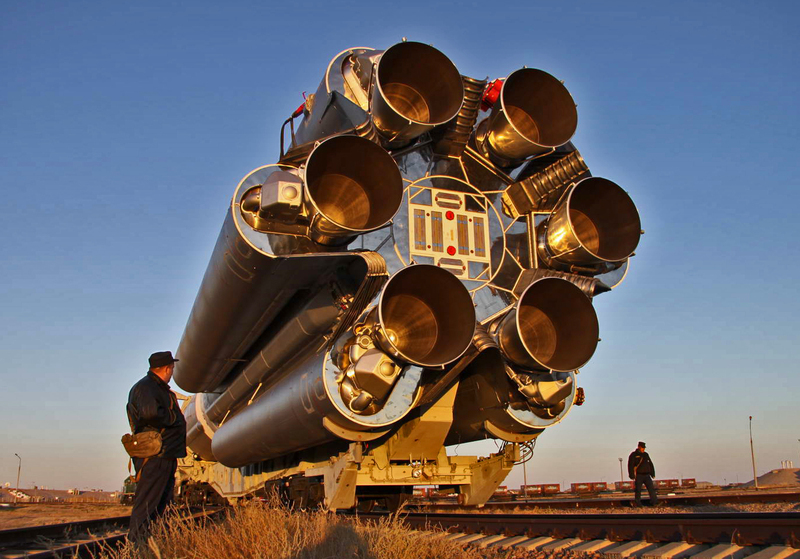 The 8S810K First Stage: Proton’s first stage is 21.18 m (69.6 ft.) tall and 7.4 m (24 ft.) in diameter and is powered by six (6) RD-275 engines which are attached not to the rocket core but to the six strap-on (outboard) fuel tanks. They use unsymmetrical dimethylhydrazine (UDMH) for fuel and dinitrogen tetroxide N2O4 as an oxidizer. The second stage boasts a specific impulse of 285 sec, delivering 10,532 kN (2,368,000 lb.) thrust with a burn time of 108 seconds. 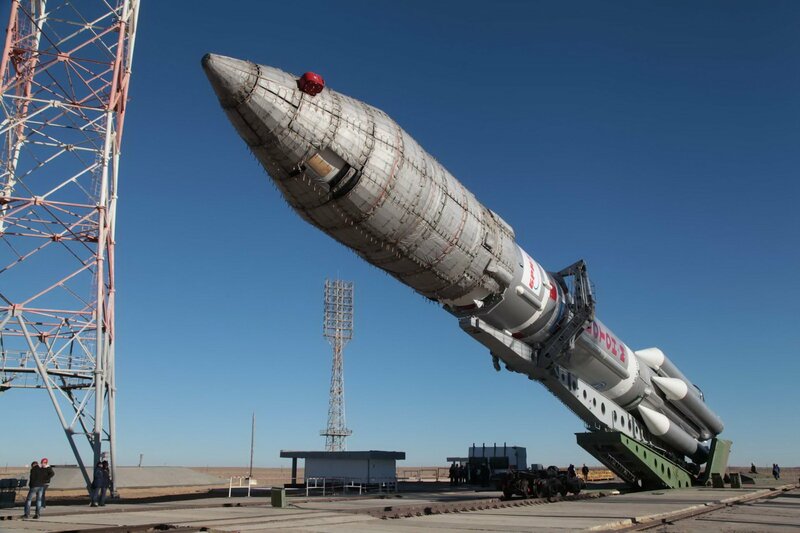 Image | This entry was posted in Images, Launches, News, Spaceflight Companies & Vehicles and tagged Amazonas 5, Amazonas5, Baikonur, Baikonur Cosmodrome, DanSpace77, ILS, International Launch Services, Proton, Proton Rocket. Bookmark the permalink.